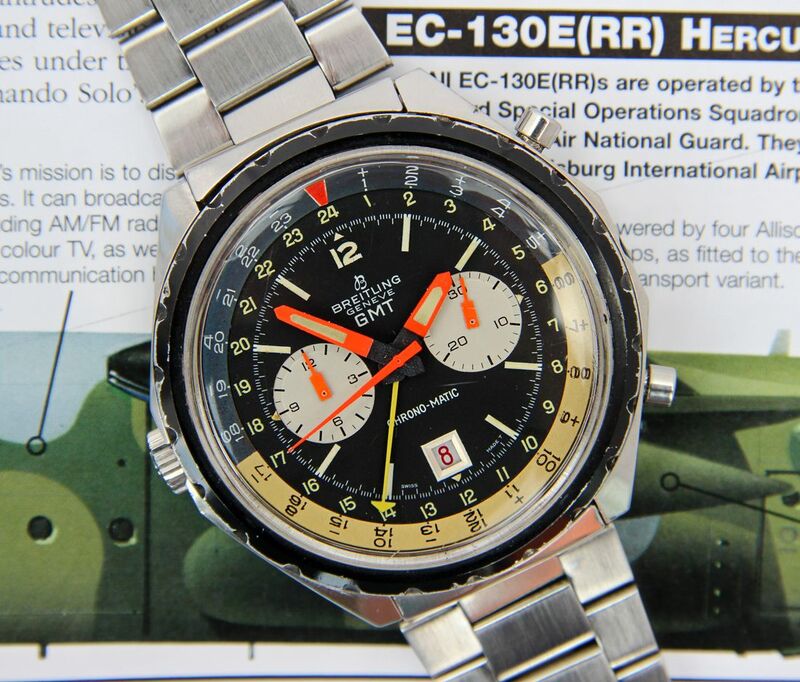 Up for sale is this scarce and original early 1970s Breitling reference 2115 Chrono-Matic GMT with beautiful original inverse panda dial, cool big orange hands and 24-hour calibrated “plus/minus” bezel for use in conjunction with the long yellow GMT hand for telling time in two timezones simultaneously. 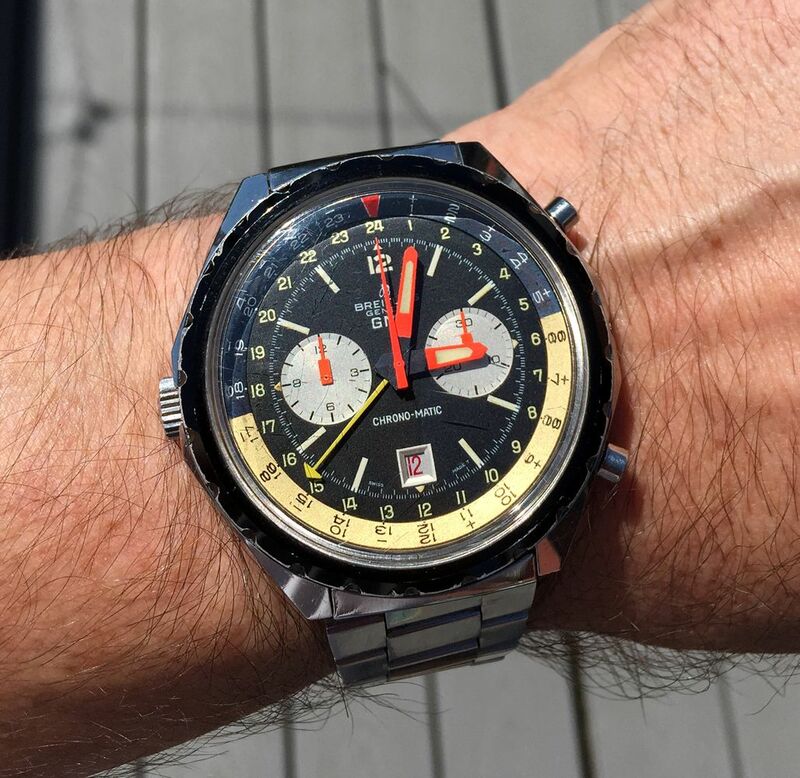 Though not for the faint of wrist, this Breitling GMT is well proportioned and is a fairly rare beast with a uniquely cool and funky layout. 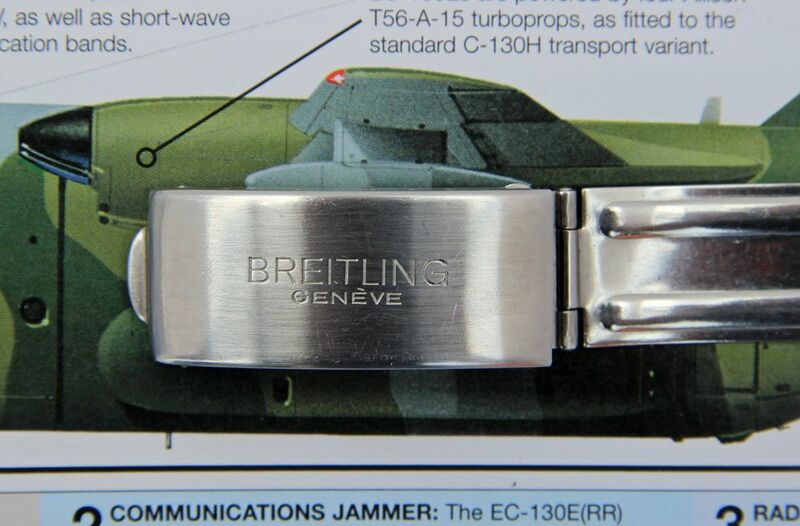 It also comes on its period correct and hard to find extra long signed Breitling bracelet. This uncommon and striking Jumbo GMT Chronomatic is in overall Excellent vintage condition and all functions are running well. This is a major league chrono-toolwatch for the major league collector that you won't see on everybody’s wrist. 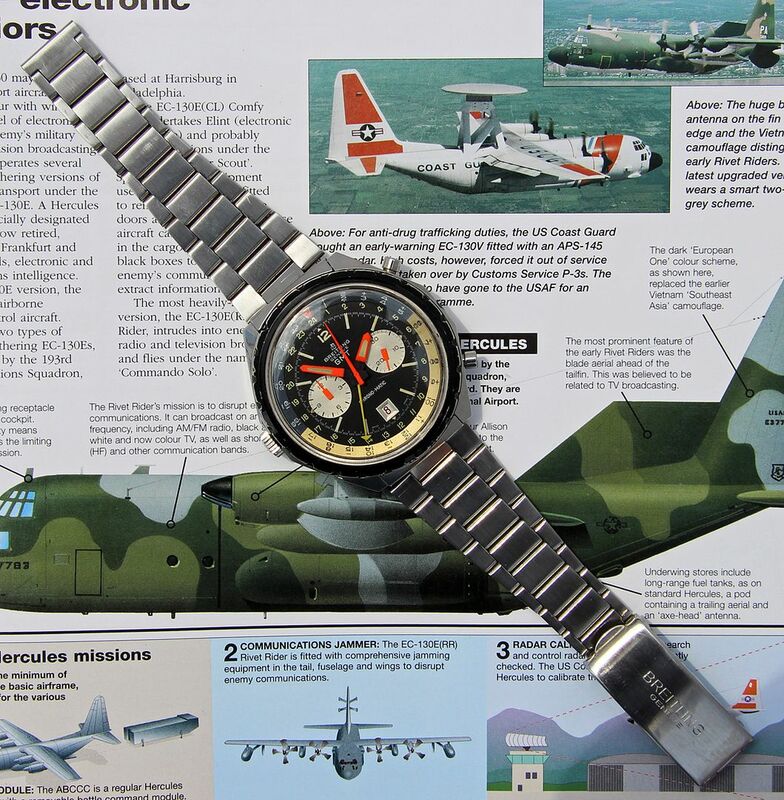 This asking price for this uncommon Vintage Breitling 2115 GMT on rare bracelet is now being BLOWN OUT to just $6,950 USD OBRO including worldwide shipping. Bank Wire strongly preferred. Other payment options upon application. Payment must be made in US DOLLARS. Watch will ship upon full clearance of the funds, as well as any necessary bank vetting. CASE & CASEBACK: Massive 47 x 49mm left-side crown case shows little to no polish that I can see, with the edges still crisp and what might only be sleeve buffing from years of wear. 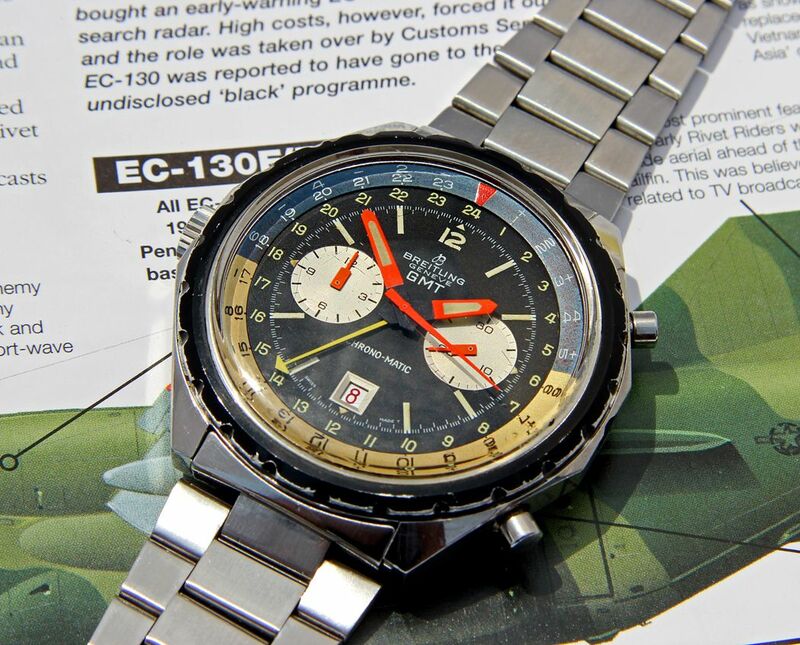 This great Breitling has obviously been worn and enjoyed in its nearly 50 years of life and the case shows minor scratches and a couple of small dings commensurate with age. Overall Excellent honest vintage condition. The outer part of the screwed polygon caseback has acquired superficial scratches and looks to have also been softened by years on a wrist. 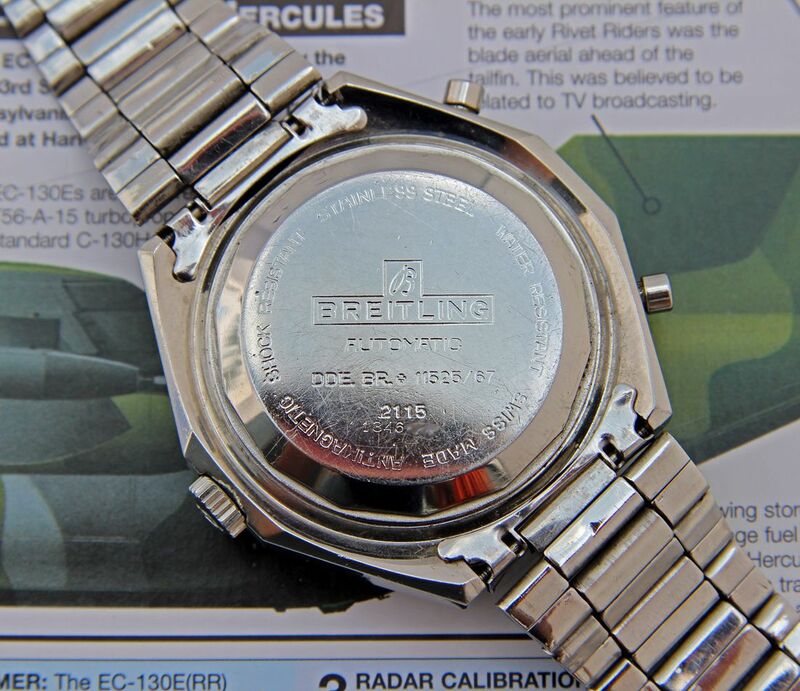 But all the original Breitling nomenclature is still quite legible including the more lightly engraved complete serial number of 1.34 million. 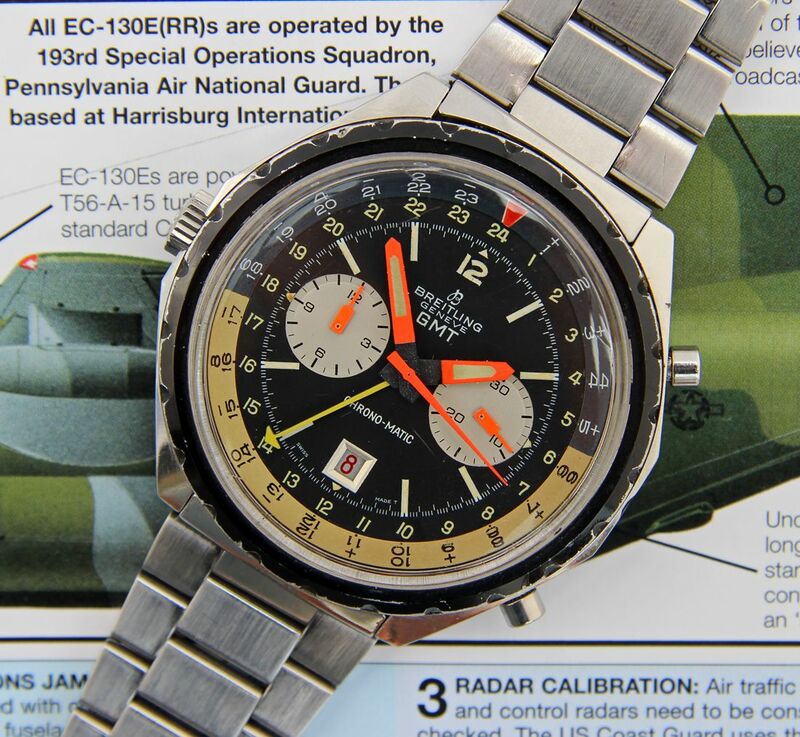 This dates the watch to circa 1970, pretty early in Chronomatic production especially for a complication. Likewise Excellent cosmetic condition for the exterior back. 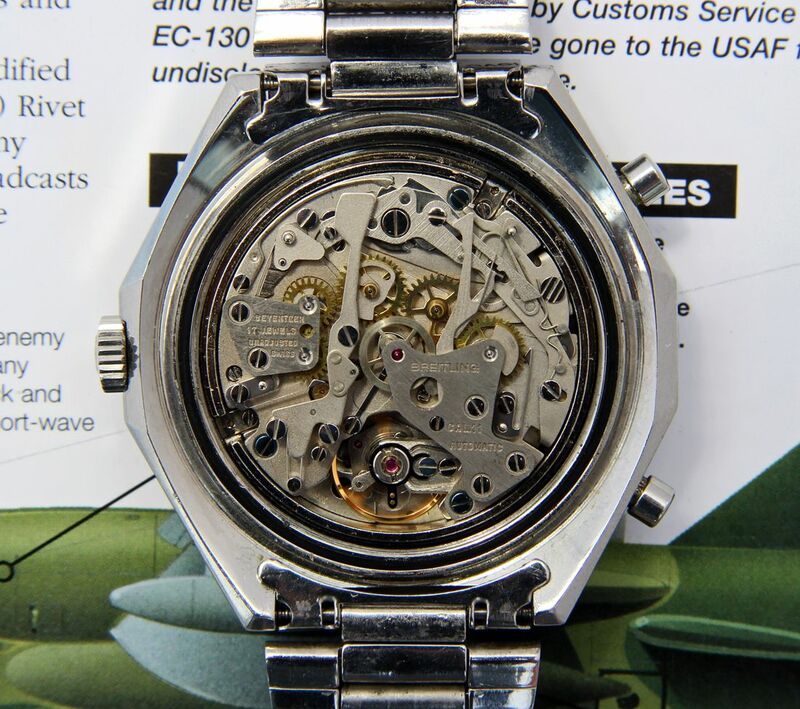 The inner caseback shows negligible corrosion and has the correct spare internal Breitling brand markings and some older service marks. DIAL & HANDS: Beautiful and unique matte black dial in Excellent+ condition. 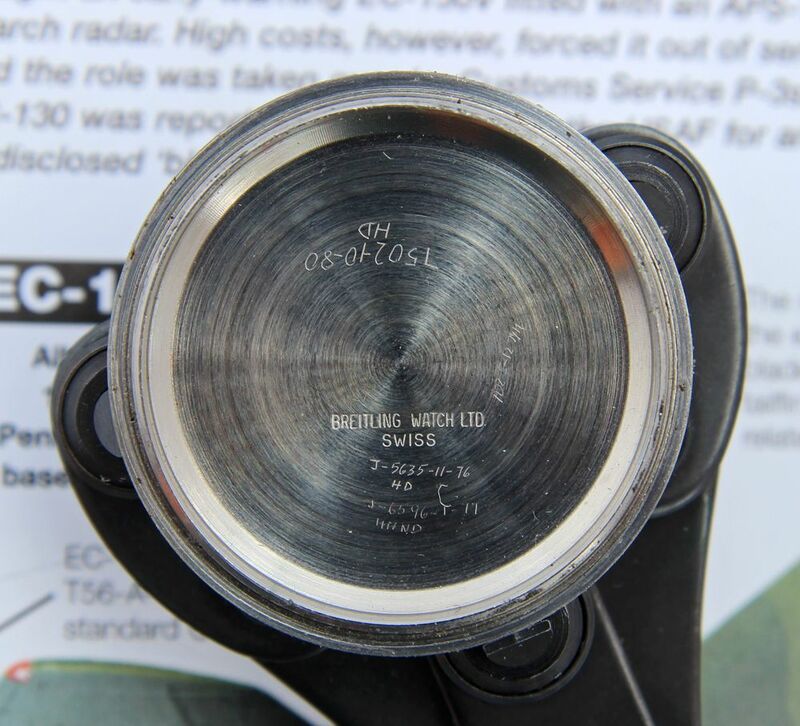 It features calibrations for 24-hour time to be coordinated with the rotating bezel, crisp printing overall and only minor imperfections to some of the Tritium luminous visible under a loupe. Engine turned silver-white chrono sub dials are bright and unmarred. Inner rotating two-tone 24-hour “plus/minus” bezel insert has developed a cool patina to its darker section and is likewise Excellent+. The red date at ‘6’ is the cherry on top of this brilliant layout — an absolutely gorgeous and complicated dial as only Breitling seems able to execute. 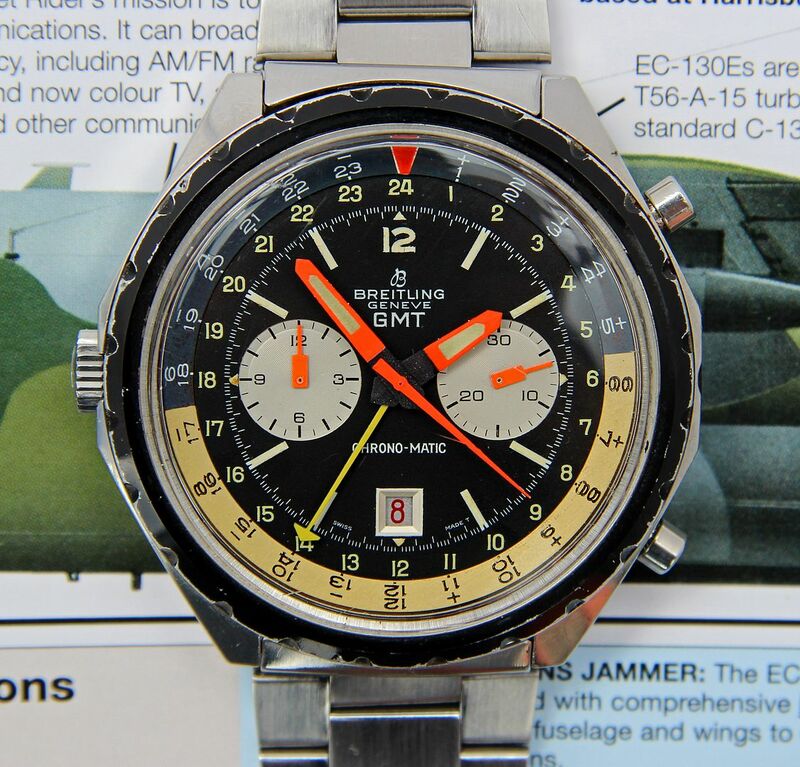 Oversized luminous-filled fluorescent orange hour and minute hands — my favorite style on a Chrono-Matic personally — are original and Near Mint, as is the long yellow 24-hour hand and the other chronograph-related hands. There is no constant seconds hand on these models. 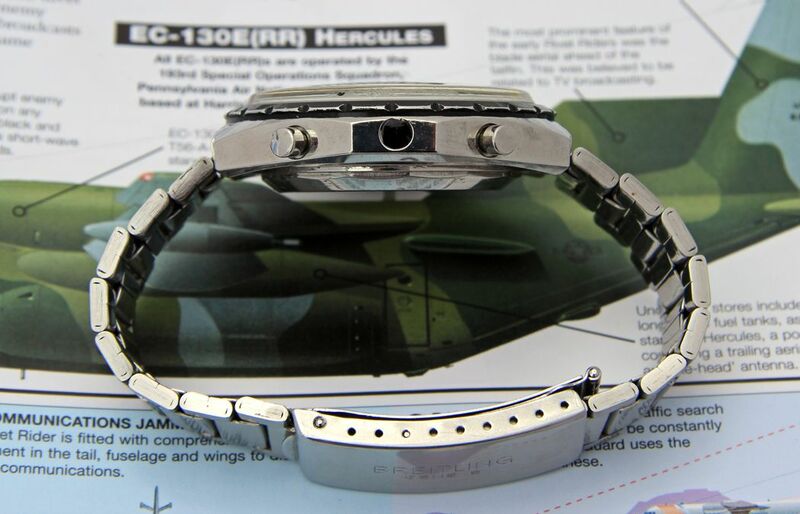 BEZEL: The anodized rotating bezel itself is Excellent with just a few marks and the typical loss of black to the edges of the chunky serrated knurling. It rotates firmly but freely in both directions for calculation of the second time zone. CROWNS & PUSHERS: Signed Breitling crown on the left of the watch in typical Chronomatic style (a la the Hueur Monaco) with the chronograph pushers on the right along with a sealed rubber plug in the middle where the crown would normally be. The large crown winds and pulls out to the time-setting position as it should. 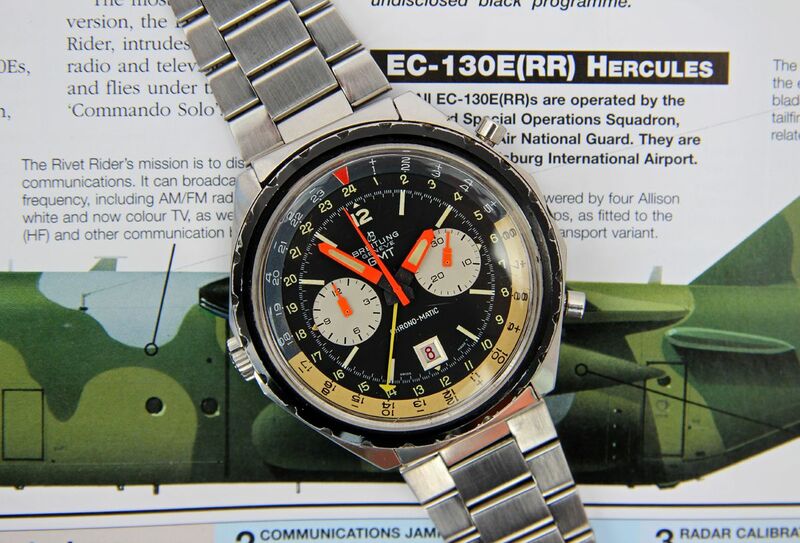 The top pusher stops and starts the chronograph and the bottom pusher resets the chrono crisply. CRYSTAL: Large low-dome acrylic crystal appears older and is Excellent with only a few deeper scratches. MOVEMENT: Legendary Breitling-Heuer micro-rotor automatic chronograph movement in rare 24-hour configuration looking very bright and clean. 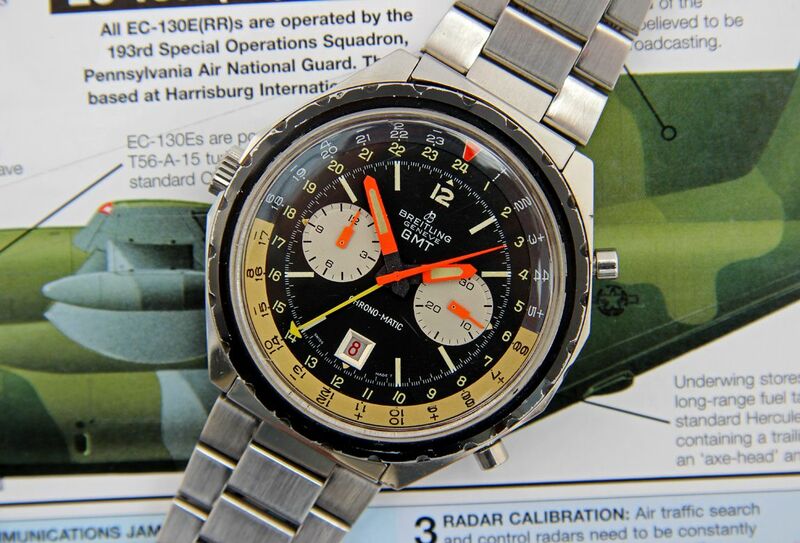 For whatever reason most of these Breitling 2115s have “Cal. 11” engraved on the bridge like this one, although technically the GMT complication makes it a cal. 14. 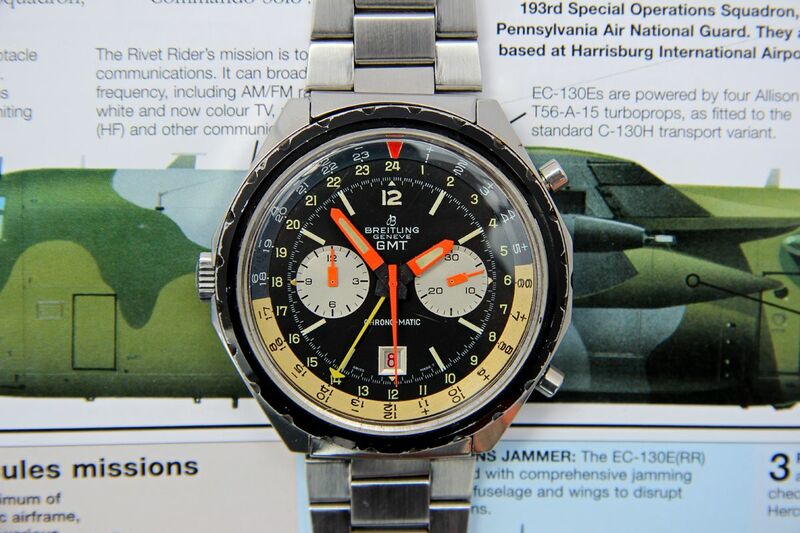 Sometimes you will see a Breitling 2115 GMT with the caliber dremmeled out on the bridge and another number added ex post facto so one can assume that Breitling were not always conscientious about marking the exact caliber especially on these early examples (same thing occurs in some Heuer GMTs, I believe). This watch has always operated so well for me that I never bothered to have it serviced. All chronograph and time-keeping functions operate they should as does the semi-quickset date feature (by rapidly moving back and forth between around 20:00 and 24:00 hours one can quickly advance the date). BRACELET: This great Breitling comes on its period original full-length 22mm end folded flat link bracelet with signed Breitling buckle. These vintage Breitling bracelets are hard to come by and are worth a small fortune in their own right when they do come up for sale. This one shows some light stretch and small scratches but is easily Excellent overall. It is very long and will fit up to an 8” wrist if not even a bit larger but can be sized down to around 7 1/4" with the micro adjustable clasp. 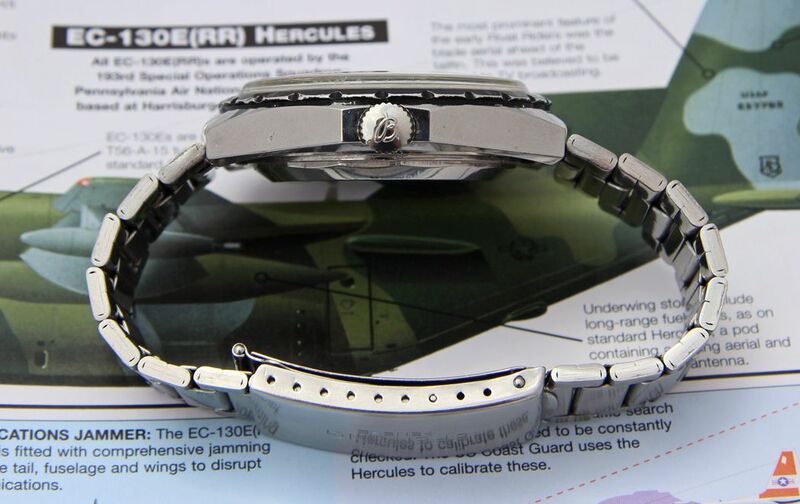 As a matter of policy I make NO guarantees for the water resistance of this watch in any way, shape or form. 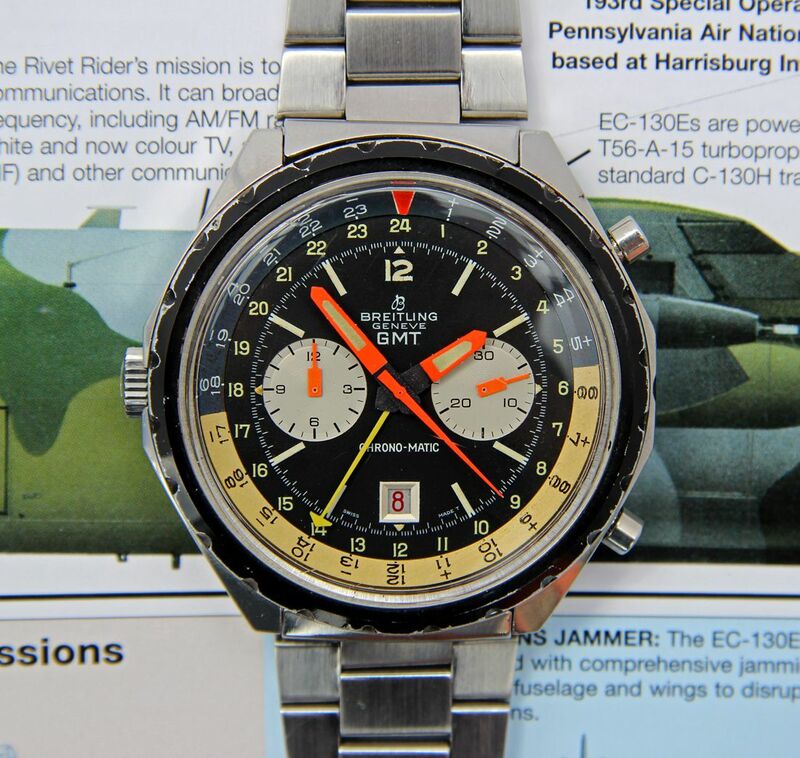 This great Vintage Breitling GMT is offered with a 3-day inspection period from the date of receipt and may be returned for a full refund less any shipping costs incurred by the buyer. This refund is unconditional and once I get the watch back in exactly the same condition as it was sent to you, your money will be refunded. Of course, once the 3 days are over the sale will be considered FINAL.